After 15 years in the United States of America I was elected as Director of the Veterinary Surgery Clinic and Professor of Veterinary Surgery at my Alma Mater, the University of Zurich, Switzerland. Before my departure I had a conversation with Michael Shires, the Chairman of ACVS, where he encouraged me to try to organize a similar surgery college in Europe. At that time specialization in Europe was in its infancy but the first activities in this direction started to appear on the horizon. When I arrived in Switzerland in spring 1989 other priorities had to be dealt with and the creation of a European College was placed on the back burner. 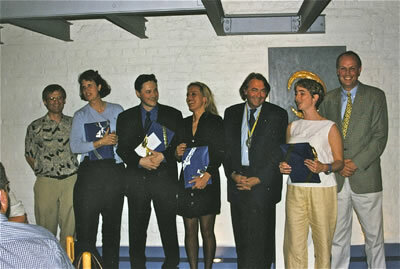 In 1990, four veterinarians interested in small animal medicine (Dr. Hans Koch, Germany, Dr. Pierre Cadot, France, Prof. Eric Tschirhart, Luxemburg, and Prof. Marc Vandevelde, Switzerland) were awarded a considerable amount of money form the European Community to launch the "European School for Advanced Veterinary Studies (ESAVS). In spring 1990, I was contacted by Dr. Koch to meet with them in Bèze, a small town in Burgundy, France to discuss veterinary specialization in Europe. 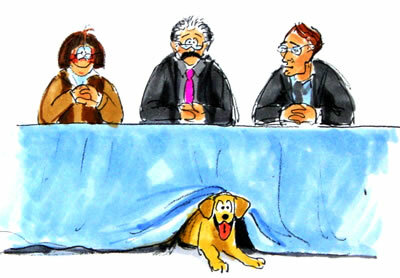 During that meeting I was asked to organize a "European College of Companion Animal Surgery". I accepted this mandate but told the group that I would organize a College of Veterinary Surgeons along the guidelines of the American College of Veterinary Surgeons and in doing so also include large animal and equine surgeons. At about the same time, I was contacted by Dr. Philippe Moreau, a former small animal internal medicine resident at Texas A&M University who returned back home to France after his residency. He was also looking into specialization and through these activities I got to know Dr. Richard White from Cambridge, a small animal surgeon, who had just passed the ACVS Board exams that year. Apparently, he was also looking into specialization in small animal surgery. The first steps: "Let's form a College"
After my return to Switzerland from Bèze, I contacted Richard White and we decided to team up our efforts. With his support, I assembled a group of European veterinarians who were involved in surgery. From the beginning it was clear that the future College had to be appealing for surgeons working both in practice and academia. In equine surgery especially, the real proponents in this field were practitioners. Therefore the list of invitees for the first organizational meeting of the future college contained a total of 6 academicians (in alphabetical order): Profs. B. Hertsch, Large Animal, Hannover, Germany; Ulrike Matis, Small Animal, Munich, Germany; Gianfranco Pezzoli, Large Animal, Parma, Italy, Joshi Toth, Large Animal, Budapest, Hungary; Freek Van Sluijs, Small Animal, Utrecht, The Netherlands, Richard White, Small Animal, DACVS, Cambridge, Great Britain and 7 practitioners (in alphabetical order): Drs. 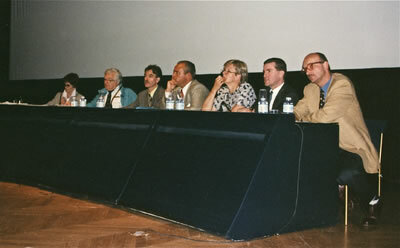 Jean François Bardet, Small Animal, Paris, France; Jacques Drapé, Small Animal, Le Bouscat, France; Bernd Huskamp, Equine, Hochmoor, Germany, Norbert Kopf, Equine and & Small Animal, Vienna, Austria; Dieter Prieur, Small Animal, Waldenburg, Switzerland as representative of AO Vet; Matteo Tommasini, Small Animal, Rome, Italy, and last but not least Brigitte von Rechenberg, Small Animal, Würzburg, Germany. Mrs Gabriela Schmid, my secretary and myself completed the group. The meeting was held on August 30 and 31, 1990 in Lenzburg, Switzerland, the little town I live in (Fig. 1). I was able to find sponsors to help finance the costs for the lodging of the participants and the meals for this meeting. The participants were provided with a draft of the potential constitution, modeled on the Constitution of the ACVS.1 After agreeing that the European College of Veterinary Surgery should be founded, one of the first discussion points was the issue of "grand fathers". After an extended debate, the decision was made that everybody who wanted to become a member of the College, including the members of the organizing committee, should pass a certifying examination. The main reason for this decision was the fact that it would be very difficult to draw the line between those accepted and those rejected without causing objection and animosity towards the fragile new College. Other potential negative effects of a "grand father clause" were a possible preponderance of academicians, a deficit of practitioners, and an excessively large number of founding members being accepted to satisfy the demands from all the different countries and different species. This was a very good decision and still is unique because ECVS is the only College in Europe and the USA that does not have "grand fathers". Have good ethical standing in life and the profession. Be a graduate of a veterinary college of a European country or a country affiliated to Europe (United Kingdom). Have devoted a minimum of 10 years in veterinary surgery in a European country. Be a professor or Senior Lecturer of veterinary surgery at a European Veterinary College. Be actively involved in 250 small animal /150 large animal surgical procedures per year. During the following months, the draft Constitution and Bylaws, modeled closely on those from the American College of Veterinary Surgeons (ACVS), were updated with the decisions made during the initial organizational meeting in Lenzburg. By the deadline of December 31, 1990 more than 200 applications were received. During these days we were frequently asked who gave us the mandate to organize this College. In the United States, the American Board of Veterinary Specialization (ABVS), established by the American Veterinary Medical Association (AVMA) oversees the activities of the different specialty colleges.1 In Europe no such board was in place because the European Community did not provide a ruling for specialization in the medical profession. Therefore in those days any group interested in forming a specialty college took the initiative and gave itself the mandate to do so. Another enquiry came from the Royal College of Veterinary Surgeons (RCVS) and involved the different meaning of the term "Veterinary Surgeon" in Great Britain and the rest of the world. Whereas this name refers to any veterinarian in Great Britain, the name is specific for veterinarians involved in the field of veterinary surgery in the rest of the world. After some discussion, the issue was abandoned with the understanding that the future College name would remain unchanged. During the last week of December 1990 a large number of applications from Great Britain and the Netherlands arrived in Zurich, which was greatly appreciated by the organizational group. It was clear that Richard White's influence in Great Britain swayed initially critical veterinary surgeons to apply for charter membership. Applications were evaluated in several stages applying the criteria established by the Organizing Committee. During the second organizational meeting held January 24th and 25th, 1991 at the University of Zurich, a total of 146 charter members were selected. All applicants were notified in writing whether their credentials were suficing the requirements or not. Additionally, the provisional constitution was finalized and approved be the committee. A membership fee of CHF 250. was decided upon, which made the College solvent having 146 charter members. During the same meeting, Brigitte von Rechenberg was offered a position at the University of Zurich, her Alma mater, as director of continuing education. She started in her new position on April 1st, 1991 and was a great help especially during the first years of the new College. 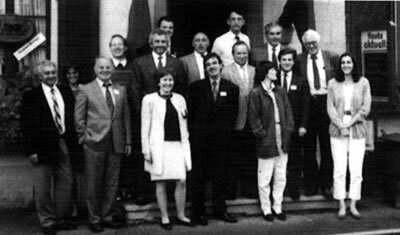 On April 11th, 1991, during the ACVS European Surgical Forum in Nice, France, the ECVS was founded (Fig. 2). The provisional Constitution was adopted by the charter members present and a Board, consisting of the following members was elected: President: Joerg Auer, Zurich; Vice-President: Richard White, Cambridge; Secretary: Brigitte von Rechenberg, Zurich; Treasurer: Jean-Francois Bardet, Paris; Directors: Antoine DeMoor, Gent, Matteo Tommasini – Degna, Rome, and Freek Van Sluijs, Utrecht. One year later, Kuno von Plocki, Neubulach, Germany was elected to the Board. It was decided to maintain the provisional Board for a maximum of five years to allow consolidation of the ideas among the members of the College and to develop it into a well functioning college. Fig. 2: Cartoon of the foundation meeting od ECVS. The three individuals that did most of the work on the organization committee are shown (from left to right) B. von Rechenberg, later elected as Secretary, J. Auer, Later elected as President of the Board, and R.A.S. White, later elected as Vice President of the Board. Golda, Brigitte's Golden Retriever was the token animal at all Board and Annual Meetings. In Fall 1991, another important event happened. After the retirement of Dieter Prieur, on January 1st, 1992, the AO Vet Center was transferred from Waldenburg (Home of Stratec Medical) to the University of Zurich. During the negotiations with the AO Foundation in Fall 1991, I was able to acquire a secretary's position at the executive level. Also I received permission that the AO Vet secretary could accept other duties, in addition to her involvement with AO Vet, as long as the latter affairs were not compromised. I offered the position to Monika Gutscher who had a background of hotel management and was returning from a one-year engagement in Beijing, China to open a hotel for Swissôtel. Monika accepted the position on the understanding that she may look around for employment within the hotel industry. Luckily for AO Vet she stayed on (Fig. 3). It was therefore a logical decision to ask her to take over the duties of the ECVS secretary as well. With the AO Foundation paying her salary, ECVS was in a very comfortable financial position and was well served with a highly professional secretary. The growth of the College lead to the expansion of its secretarial staff. It was clear that the arrangement with the AO Foundation would not last forever and the Board of Regents started to make plans for the inevitable change. Therefore the membership fees were gradually raised and the increases were accumulated in a special fund. In 2004, Miriam Crivelli, a colleague of Monika's from the days of Hotel Management School joined ECVS as a part time employee. In 2009, Eva-Linda Skytting joined ECVS and together with Miriam shares a 100% job. In 2011, Judith Huettl joined ECVS, again in part time employment. The arrangement with the AO Foundation continued until December 31st, 2010, when a new contract was signed. This defines Monika's working time as 50% for AOVET and 50% for ECVS. 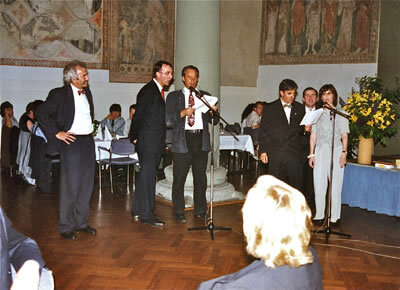 The first Annual Meeting was organized at the end of June 1992 in Lenzburg, Switzerland. Lenzburg was selected because it was the site where the first organizational meeting of the ECVS had been held. It was easily reachable by plane, train and car, had good hotels and restaurants, and encouraged close contact among the charter members and meeting participants. The latter was felt to be an important factor, because the charter members, coming from different European countries and being divided into small animal and large animal specialists, were a heterogeneous group. The meeting started with a "state of the art" lecture for all the delegates by a specialist in the field of human surgery. After this lecture the delegates could choose between a small animal and a large animal program. The last lecture was again presented for both subspecialties together by a specialist in the field of human surgery. This basic organization of the meeting is still maintained today. Selected ACVS Diplomats are invited to speak at the small animal and large animal sessions together with ECVS Diplomates. The spirit of that meeting was very special and set the stage for the following meetings. The social program is an important part of the ECVS Annual Meeting and represents major difference to the ACVS Annual Meeting, recently termed Symposium. The Annual Meeting of ECVS is held every year in a different city in Europe, offering its meeting participants a wide array of parties and activities (Appendix 1). 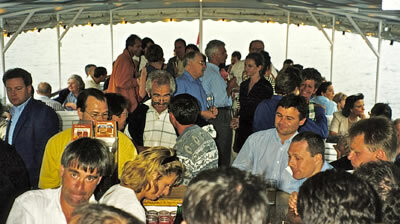 The welcome reception is frequently hosted by the fathers of the host city and is generously sponsored. If available, a boat tour is offered the following evening (Fig. 4) and on the last evening a banquet is organized where the different awards are distributed. Frequently a band is present, inviting delegates to enjoy dancing and other entertainment into the early hours of the morning (Fig. 5). It was felt from the beginning that social activities such as these were important to develop a feeling of belonging among the Diplomates of ECVS – and it works. This statement is also echoed by ACVS Diplomates that participate at the ECVS Annual Meetings, some of whom show up every year. In 1993 the first examinations were organized for charter members only. The examination consisted of a practical and an oral part. The examiners were ACVS Diplomates with close ties to Europe and past experience in the ACVS Examination Committee. Sixty-two Charter members took the inaugural examination and 41 of them passed both parts the first time. At the same time ACVS Diplomates involved in ECVS were accepted as ECVS Diplomates, having passed the examination of the ACVS at an earlier time. From the first tranche of ECVS Diplomates a Credential Committee and an Examination Committee were elected. It was important to evaluate potential candidates wishing to take the ECVS examination some time down the line. Initially the College wished to entice as many of the charter members to take the examination as possible. 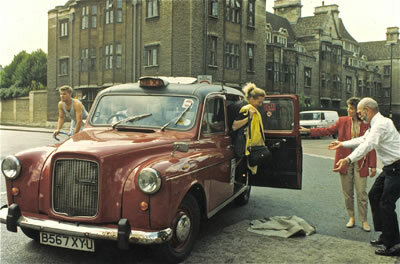 Therefore additional examinations were offered just for charter members in January and June 1994. Again these examinations were administered mainly by former ACVS examination committee members. From that time on, it was planned to hold the examination prior to the Annual Meeting. The charter members were given the opportunity to take their version of the examination (oral and practical part only) until 1996. From that time on, it was agreed they would have to take the full examination, which includes also a written part. Those charter members who did not take the examination are still recognized as such, appreciating their initial involvement in the formation of the College; however they were not accepted as Diplomates of the ECVS. The first non-charter members were allowed to take the now three-part examination (written, practical and oral parts) in 1995. These candidates had not completed a residency but fulfilled at least 6 parameters of the original charter members' criteria. The written examination included 42 general questions to be answered by the large and small animal examinees and 128 specific species oriented questions. The questions were divided into 7 different groups representing anatomical systems and according the significance of the systems more or less questions were allotted. Separate blueprints were developed for the joint general part and the two species –oriented parts. The other two parts were separate for the small and large animal candidates. The large animal part contained between 15 and 30% food animal questions dependent upon the fact whether a food animal candidate was taking the examination. The practical part consisted of 25 double slides and the associated multifaceted questions that had to be answered. Initially 6 minutes were allowed to answer each double slide questions, followed by a 1-minute review period for each slide at the end of each part. The reason so much time was allotted was that most of the examinees did not have English as mother tongue. To make this part of the examination tolerable, it was divided into 2 parts. This part was from the beginning separate for small animal and large animal candidates. Again the large animal part contained between 15 and 30% food animal questions. The original oral part of the examination entailed candidates answering a series of questions relating to the management of 3 cases in the small animal part and 4 cases (2 soft tissue and 2 musculoskeletal) in the large animal part. In the large animal part, 1 question usually related to a food animal case. To be able to examine all candidates uniformly, all examinees were asked the same questions. Therefore all examinees for the morning examination were assembled in one large room. Each examination lasted 55 minutes. At the end of the examination the examinees were assembled in another room. Once the examinees for the afternoon examinations were assembled in one room again, the morning examinees were released. The afternoon candidates were allowed to leave after they had finished their examination. For the inaugural examination, two sets of questions had to be developed because the oral examination took 2 days. Since 1995 the outgoing small animal and large animal members of the ACVS Examination Committee have been invited to be part of the ECVS Examination Committee. These ACVS Diplomates actively participated in the assembly of next year's examination and played an integral part raising the quality of the ECVS examination. An evaluation conducted by ACVS several years ago revealed that the ACVS and ECVS examinations were identical. The basic form of the examination was maintained over the years with small changes implemented when the need arose. However, after the ACVS changed to the case based format a few years ago, the oral examination was altered to mirror that change two years later. ACVS had permitted an ECVS small and a large animal examination committee member to observe their examination, which lead to change the following year, a move that was welcomed by the examinees and the examiners alike. In the case based format the cases are presented and answered page by page by all candidates at the same time. This led to a more uniform examination and diminished language problems frequently encountered during the previous oral examination because most examinees were more accustomed to read and write in the English language than answer questions under strict time constraints. Another major change to the examination occurred in 2008. Organizing the examination prior to the Annual Meeting was associated with considerable costs for ECVS and the examinees. Further, as the number of candidates increased, so did the logistical problems associated with holding the examination at a different venue every year. Also many examinees left after the examination and did not participate in the Annual Meeting. This led to the dissociation between the Board examination and the Annual Meeting after 2008. Since 2009 the Board Examination has been administered in late January or early February during the semester break at the Veterinary College in Zurich, followed by the Annual Meeting in late June or early July. This change also led to changes in the start of the Residencies, the due date of credentials and the meeting times of the credentials and examination committees as well as the Board Meetings. While the examinees initially had three attempts within 4 years of being eligible to take the examination to pass all tree parts, and, if desired, to re-apply for the examination providing proof that the examinees were still active in the field of Veterinary Surgery by turning in at least one copy of a published case report or an original publication and the personal case log since being accepted for the examination the first time. If accepted, the candidate had an additional three attempts to pass all three parts of the examination. The EBVS demanded that ECVS changed this policy to provide each candidate a total of four attempts to pass all parts of the examination, without the chance to reapply. The ECVS Board of Regents accepted this change, which was approved at the Annual Meeting in 2009. At the Annual Meeting in 1995 the final constitution was adopted, leading to the election of a Board of Regents consisting of the president, past president, president-elect, Executive Secretary, Treasurer, as well as 3 large and 3 small animal Regents (Fig. 6). The President-elect, President (Appendix 2) and Past President hold each office for one year, which resulted in a 3-year assignment. The Past President serves as Chairman of the Board of Regents. Generally the positions are offered to former members of the Board of Regents. The Regents are usually selected among former Credentials- or Examination Committee Members. Every year a small and large animal regent each is stepping off the Board of Regents and is replaced by the newly elected Regents. A serious attempt is made to make sure that practitioners and academicians as well as Diplomates representing the different European Countries are represented on the Board. The ECVS Diplomates serves as election body. While attempting to keep the distribution even, it is clear Great Britain is overrepresented on the Board of Regents. Using English as the official language of ECVS represents the main reason for lopsidedness of representation. The Treasurer and Executive Secretary are initially elected for a 3-year term by the ECVS Diplomates. These positions are renewable and it makes sense that the elected diplomats keep their position for at least 6 years to assure maintenance of continuity. The initial Board and after 1995 the Board of Regents met three times a year: just before and on the last morning of the Annual Meeting as well as in early January in Lenzburg, the birth place of EXCS. With the date change of the examination the meeting schedule had to be changed as well. The Board of Regents meets presently before the Annual Meeting in late June / early July, in September together with the selection of the Board-eligible Residents, and at the time of the examination to elect the examinees that passed all parts of the examination as Diplomates of ECVS. The seal of the ECVS is held in the European colors to emphasize the European nature of the College. The silhouettes of a horse head and a sitting dog enclosed in a circle signify that large and small animal veterinarians are united in the College. The scalpel between the figures represents the surgical specialization of the members of the College. The President of ECVS wears a medallion of the ECVS Seal around his/her neck denoting official ECVS representation at the ECVS and ACVS Annual Business Meetings (Fig. 7). 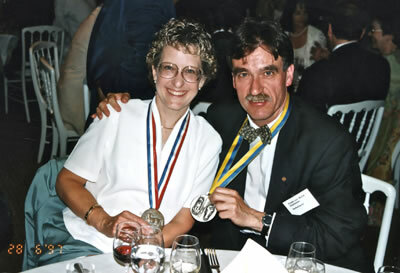 A medallion representing the seal of the ACVS was presented to the President of ACVS during the ACVS Annual Meeting in 1994 as a gift from ECVS (Fig. 8). In 1994 Residency programs were introduced and all European veterinary colleges were encouraged to set up such programs in their college. Guidelines for setting up residency programs were developed and adopted by the Board of Regents. The standard Residency program consisted of three years of training in a small animal or large animal clinic at a veterinary college or in a specialty clinic, and 100 hours of training diagnostic imaging, anesthesiology, and pathology/clinical pathology, respectively. With the years these guidelines were amended to represent the changes in training. Training was extended to 100 hours of internal medicine, a case log form was developed and the facilities of the clinic have to be documented in detail. Presently, Small animal residents have to assist in at least 240 surgical cases and act as primary surgeon in 160 such cases (Appendix 3). Equine and large animal residents have to assist in at least 200 surgical cases and be the primary surgeon in 100 surgical cases, however the distribution as to the systems is different between equine and large animal residents (Appendices 4 & 5). Additionally 50 lameness examinations have to be documented. The residents have to maintain an activity and a presentation log that has to be turned in together with the other application documents. Proof of publishing at least one major publication and a case report or a second-author publication has also to be turned in. Because not all veterinary surgery professor position in the European veterinary colleges are filled with ECVS Diplomates, alternat avenues had to be developed. The Non-Diplomate Professors could apply to be accepted as Residency Supervisors. Presently still 13 Non-Diplomate Professors are certified to supervise Residents in standard residencies. This was not possible for specialized practitioners. Also, initially many specialized veterinary surgeons were active and neither in position nor willing to start a residency program. For these specialist surgeons Alternate Residencies were implemented. The program lasts longer and is tailored to the expertise the applicant has. The credentials committee proposes the program to the Board of Regents, which approves the program. All Residents have to turn in a yearly report on their progress towards board eligibility accompanied by an evaluation fee. The Credentials Committee evaluates the progress reports and reports their findings to the Board of Regents. The Committee also presents the list of accepted and rejected candidates of the board examination to the Board of Regents. The accepted candidates are hardly discussed, whereas varying discussions me develop about the reasons for rejection. Presently 165 Residents are in training in a total of 59 training programs. The Residency Programs themselves have also to be approved by the Credentials Committee. The surgical facilities and the ancillary facilities such as diagnostic imaging, clinical pathology, anesthesiology, internal medicine have to be documented in detail. Each diplomate is allowed to supervise 2 residents in training. The resident Presentation Award was installed by the Board of Regents in 1996 for the best presentation during the Resident Forum at the Annual Meeting. The manner of presentation, structure, materials and methods, statistical analysis and presentation aids were judged by a panel. Initially one award was bestowed for the best presentation of the the combined small animal and large animal Residents Forum. The first winner was David Frisbie of Colorado State University. He presented an excellent paper on a large animal topic. There was no discussion, he was the best. Several Diplomates did not agree with awarding an ACVS Resident and it was decided that in the future the award had to go to an ECVS Resident. The following year the awards for the combined Residents Forum was divided into Research and Clinical topics and winner and runner-up awards were bestowed. IAMS Company sponsored the awards from 1996 to 2001 (Fig. 9). In 2002 the Residents competition was changed again into small animals and large animals with a winner and a runner-up award in each competition. The distinction between clinical and research topic was stopped. Since 2002 the award is sponsored by ECVS. In 1999 ECVS started discussing the possibility of publishing the European Journal of Veterinary Surgery with Blackwell Science. The discussions went well and the Board of Regents was close to sign a contract with the publisher. In the last minute ACVS, not looking forward to loose ECVS subscribers, proposed to start catering more to the European market and to include the ECVS logo on the title page, if ECVS did not publish its own journal. Additionally ACVS proposed to install a European Associate editor, to accept an ECVS member at the Journal Advisory Board and to increase the acceptance rate of publications deriving for ECVS Diplomates and their residents. Additionally ECVS was asked to provide a selected number of reviewers for Publications. Despite a good offer from Blackwell Science with a potential to receive royalties within a few years, the ECVS Board of Regents to accept ACVS' offer and dropped the plan of publishing its own European Journal of Veterinary Surgery. Providing almost 500 subscribers, ECVS should re-negotiate the contract with ACVS and ask for a certain amount of royalties or reconsider publishing its own journal. The Special Achievement Award was established in 1995 and sponsored by Ethicon Ltd. Edinburgh, Great Britain. The inaugural award was presented to Monika Gutscher, the secretary of ECVS, for her tremendous work at the ECVS Office in Zurich. Her untiring efforts contributed greatly to the successful start of the ECVS. The 1996 award was bestowed to Marc Bloomberg Foundation in honor of the late Marc Bloomberg who was an avid fan of ECVS and was an invited lecturer at every ECVS Annual Meeting up to his untimely death. In 1997 the award was presented to American College of Veterinary Surgeons for their continued support of ECVS and their instrumental role in the examination process throughout the years. 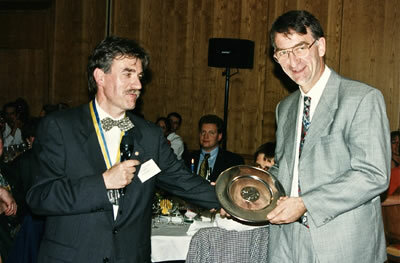 In 1998 Ethicon stopped sponsoring the award and since this time it was not presented any more. The other key decision involved the invitation of the ACVS President to the ECVS Annual Business meeting. The fact that the first two presidents of ECVS were also ACVS Diplomates who went to the ACVS Annual Meeting anyway, resulted in reciprocity in this aspect. During the initial 4 years of ECVS I was invited to discuss the progress of ECVS with the ACVS Board of Regents and report on it at the Annual Business Meeting. As of 1996, a mutual agreement was reached that each College should send its President to the Annual Meeting of the other College and bear these expenses, a decision that is still in place today. The President of ECVS every year addresses the membership of ACVS during their Annual Business Meeting and vice versa. In 2000, ECVS was the first College to acquire full recognition-status by the European Board of Veterinary Specialisation (EBVS), which underlines the leading role the surgeons played in the development of the European Specialty Veterinary Colleges. Additionally, the constitution of EBVS and many European Specialty Colleges was based on the ECVS constitution. The first president of EBVS was Freek van Sluijs, the third ECVS President. A few years later Brigitte von Rechenberg held that position as well. It is interesting to note that in times of real need ECVS Diplomates acted as Presidents of EBVS. Presently Stephen May, also a former ECVS President is on his way on becoming President of EBVS, again at a time of major changes. The constitution of EBVS demand of its Colleges that the Diplomates hat to be recertified every 5 years. In 2002 The Board of Regents started to discuss the process of recertification and decided to implement it in 2003. Recertification could be achied in two ways: 1. By completing a form and listing their activities during the last 5 years. A total of 100 points had to be accumulated. 2. By passing the practical portion of the ECVS Board Examination. The first tranche of Diplomates certified in 1993 were asked to turn in their documents in November 2005. The Recertification committee evaluates the documents and reportes their results to the Board of Regents. The successful Diplomates will be recertified for 5 years. Failing to recertify had consequences. The diplomats would not be registered as European Specialist by EBVS, he/she could not accept new Residents (the ones presently in the program under his/her supervision was allowed to complete the program), and could not be elected in office. The initial form was amended to facilitate practitioners who would not be active in publications (Appendix 6). The program works and can be completed with a minimal effort as long as the Diplomate is active. The latest parameter incorporated is, that the Diplomate has to participate in at least 2 ECVS Meetings or ACVS symposiums within a 5-year period. The growth of the College has been rapid and presently accounts for 457 Diplomates and the College expands at an annual rate of approximately 20 to 40 Diplomates. It is clear ECVS is here to stay. Procedures are still amended as the need and or the situation arises. The Book of Procedures is regularly updated to provide a solid base for running the College efficiently and effectively. Not all problems are solved yet, but the next generations need also to have some work. 1. Pettit GD. The American College of Veterinary Surgeons – the first 25 years. Vet Surg 19 (1): 3-13, 1990.